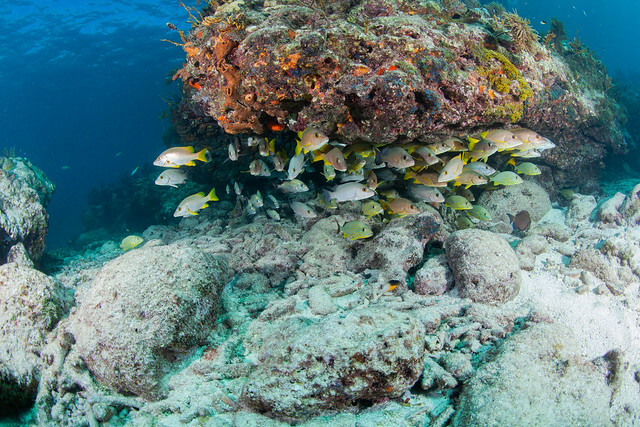 This morning at Benwood Shipwreck divers were thrilled to see the lovely Key Largo reef fish and soft corals growing all over the Benwood Shipwreck. This site is super full of color. Sail Fish Scuba PADI Instructor and dive guide Thomas guided our 2 guests and the 1 guest from the Marriott Pirate Cove Watersports was joined by their staff member diving. Everyone was stoked this morning at the Florida sun shining brightly and making the photos even that much better. Key Largo Dive Shops working together to make sure all tourists get to see our amazing coral reef while visiting. The second site at French Reef fish came by to get a closer look at our dive guide’s camera. We just love working with all the other friendly Key Largo Scuba Operators to make trips happen for all the tourists in the off season. By combining all our shops guests onto one boat for each tour, we all win and no one has to cancel their tourist for lack of enough to run a tour. This afternoon at Spanish Anchor Site dive guide Thomas showed guests the cool things to see at this site. Inst. Thomas had fun with the camera and got nice shots to remember this dive. The second site at Aquarium Reef Site PADI Instructor Thomas guided the divers and took fun photos of everyone. At Sail Fish Scuba we love sending our guests home with photo memories of their tours with us. Dive shops working together to save tourists dives. Wow the fish of the Florida Keys! Living coral reef visited today. Key Largo Dive Shops Working Together Saves The Day! Crew of Pirate Cove Watersports hosted us on their boat. To work together for the tourists & combine all on 1 boat today.